To celebrate social media’s infatuation with nostalgia, remember fantasy football stars of yesteryear and to introduce those unfamiliar with WhatIfSports’ NFL DreamTeam feature, we’ll be rewinding and reminiscing fantasy football days gone by each week. Last week, Rodney Hampton’s 1995 All-Stars couldn’t catch the 2015 Kansas City Chiefs. Looking back at Week 5 of the 1990 NFL season, Andre Rison – a personality who would have thrived in today’s social media age for better / for worse – torched the New Orleans Saints. Boomer Esiason and the Bengals didn’t have a great 1990 season. Two years removed from their Super Bowl loss to the 49ers, Cincinnati finished 9-7 and Esiason tossed a career-high 22 interceptions. His 5.5 percent interception rate led the NFL that season. However, against the Rams in Week 5, he posted 490 passing yards with three touchdowns – two to James Brooks and one to Harold Green. So, Boomer finished the season with 24 touchdown passes – which ranked fourth among QBs – but finished 13th in pass attempts (402). For those unfamiliar, Seahawks running back Derrick Fenner’s pre-NFL resume includes a murder charge that was later dropped after he spent 44 days in jail in addition to cocaine possession, which he plead guilty. As you may have guessed, the two incidents didn’t allow for 5-foot-11, 240-pound fullback to graduate from North Carolina. The red flags haunted him and Fenner’s draft stock slipped to the 10th round of the 1989 NFL Draft. His best season was 1990 where he and Gary led the league with 14 rushing touchdowns. What’s crazy is that in his eight other NFL seasons combined, Fenner only scored 20 more touchdowns – less than three touchdowns per season. How often do you hear the phrase “The NFL is a now a pass-first league” or “The NFL is now a quarterback league?” All the time, right? The keyword in the phrase is “now” because most football fans in their 50’s and older remember the league as three yards and a cloud of dust. Before Randy Moss, Terrell Owens, Chad Ochocinco, and Keyshawn Johnson, the quintessential confident-bordering-on-cocky-diva wide receiver was Andre Rison. 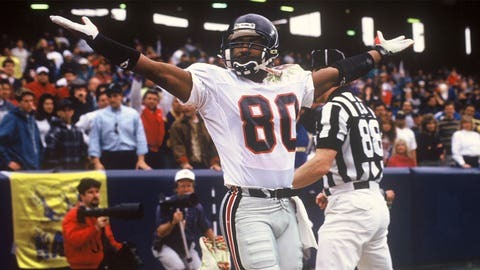 In 1990, his second year in the league, Rison was one of only two players to record more than 1,200 receiving yards and double-digit touchdowns (10) with the other receiver named Jerry Rice. From 1990-1994, only 11 receivers matched the 1,200-plus receiving yards and double digit touchdowns – Rison was three of those 11 receivers. However, circling back to the previously mentioned “then and now,” NFL offenses shifted in 1995 when 12 receivers recorded 1,200-plus receiving yards and eight of those 12 posted 1,200-plus receiving yards with double-digit touchdowns in the 16-game campaign. Inside the Box Score: Josh McCown’s two interceptions, Gary Barnidge’s two receptions for 40 yards and Travis Benjamin’s three receptions for 69 yards were all held in check by my 1990 Houston Oilers’ defese – who you know were rockin’ the Columbia Blue jerseys. Fenner led the offense with 80 rushing yards and two scores. It was good to see 30-year-old Ricky Sanders make the most of limited targets. So give it a whirl, create your Fantasy Football Dream Team mixing players from different eras and teams to construct the ultimate roster. Back next week with another WhatIfSports fantasy football flashback.